There is nothing better than the sound of a sizzling fajita platter coming to your table at a Mexican restaurant. Served with warm corn tortillas, shredded cheese, salsa, and avocado – this dish just screams deliciousness. 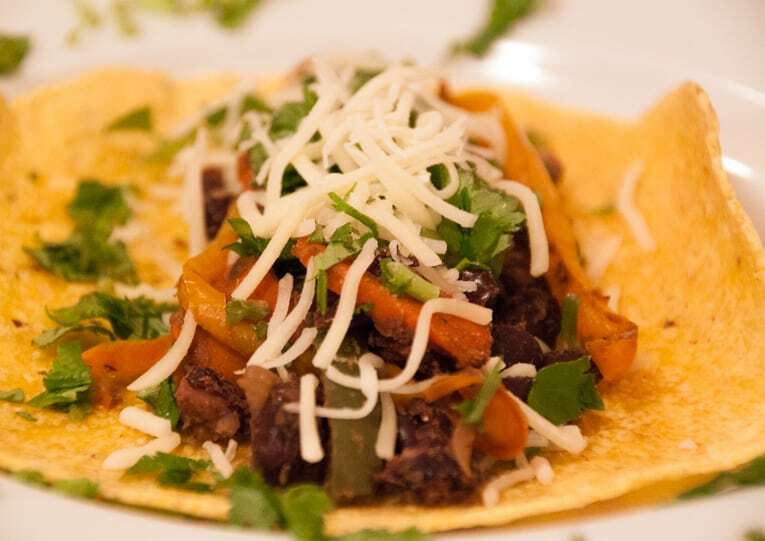 I’m a creature of habit – every time the husband and I go to a Mexican restaurant, I’ll usually order fajitas. I love them not only because they are tasty, spicy and served right off the grill, but also because it allows me to customize my own tacos/burritos from the platter: I can add more veggies and less cheese, just a tiny smidgen of sour cream and guacamole, and tons of salsa to keep it healthy but still super flavorful. A lot of times, I’ll take some of the veggies/toppings home from the restaurant to use for my lunch the next day. Now that we have Layla and eating out doesn’t happen quite as often, I was determined to recreate the restaurant experience of fajitas at home. I came across this recipe from CookingLight, and I knew I could customize it to make it veggie-friendly and healthier than the original! And my smoky vegetarian fajita recipe was born. A super fun and fast dish to make that the whole family will love! Step 1: Heat a pan over medium heat. Add 2 tsp extra virgin olive oil. Add onion, peppers, and carrots, saute for 3-5 minutes. 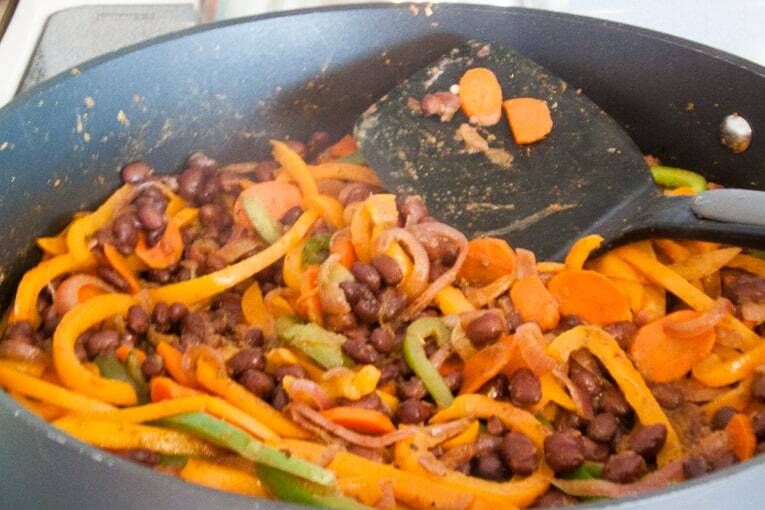 Step 2: Add all of the spices – paprika through cayenne pepper – to the veggie mixture. Saute another 10 minutes until the vegetables caramelize. Add black beans and cook another 5-10 minutes until heated through. Step 3: Divide black bean/bell pepper mixture evenly among the tortillas. 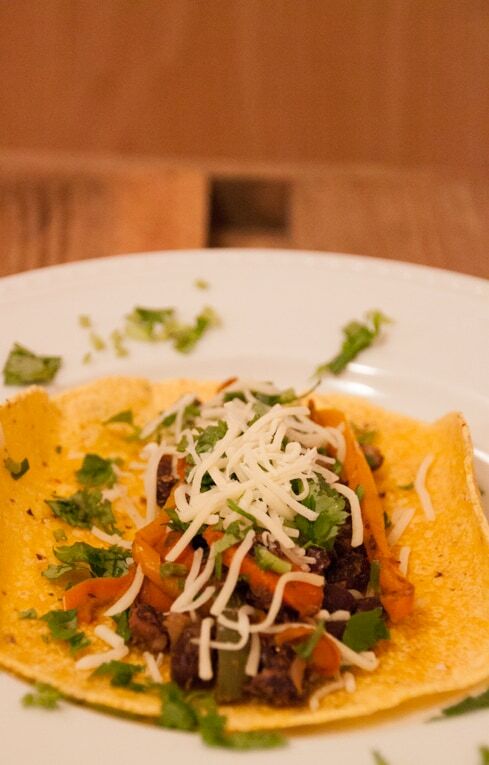 Top with 2 tbsp shredded cheese and 1 tbsp cilantro. (Add salsa or guacamole/avocado, or other toppings as desired). And there you have it. 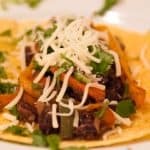 Healthy, spicy, satisfying fajitas for under 400 calories for your whole dinner! I love eating out but with a kiddo it doesn't happen often. Instead, I created this super fun and fast dish to make that the whole family will love! Heat a pan over medium heat. Add 2 tsp extra virgin olive oil. 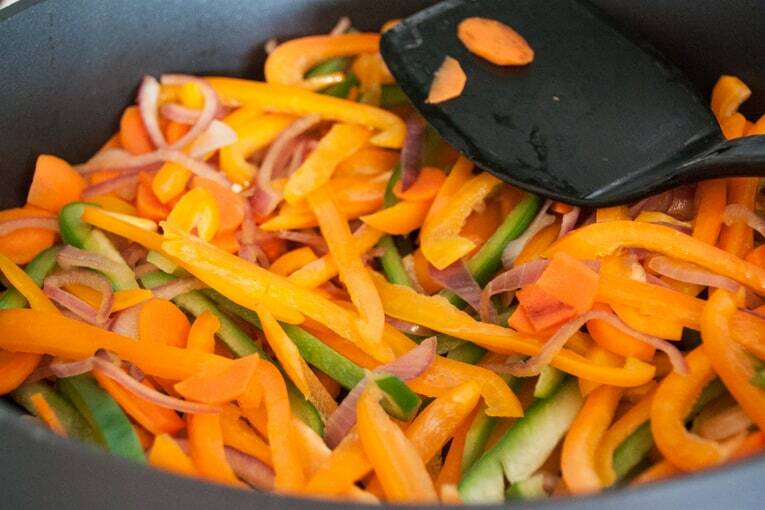 Add onion, peppers, and carrots, saute for 3-5 minutes. Add all of the spices - paprika through cayenne pepper - to the veggie mixture. Saute another 10 minutes until the vegetables caramelize. Add black beans and cook another 5-10 minutes until heated through. 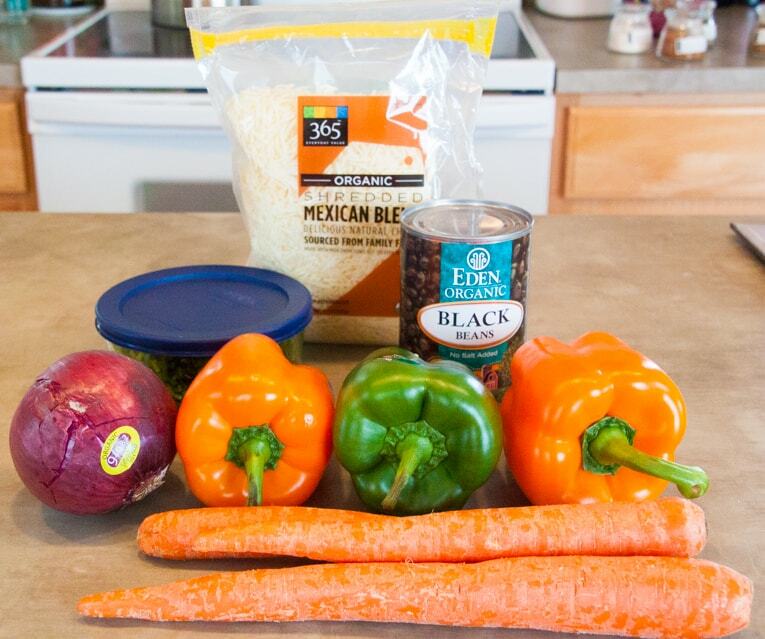 Divide black bean/bell pepper mixture evenly among the tortillas. 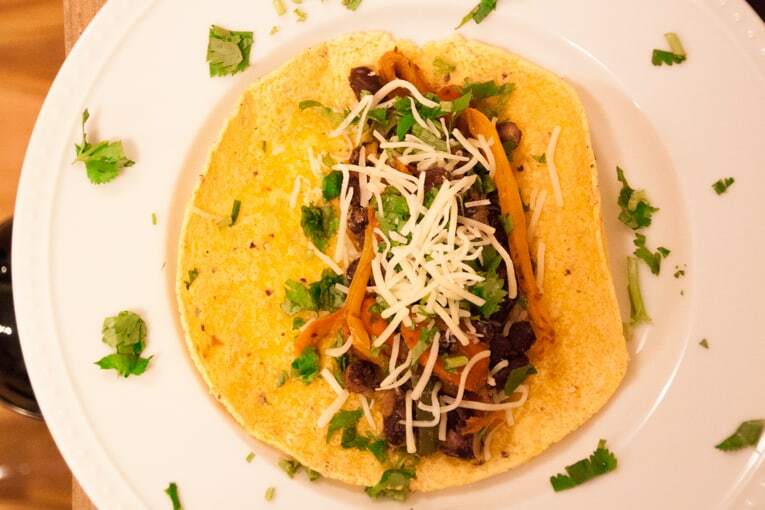 Top with 2 tbsp shredded cheese and 1 tbsp cilantro. (Add salsa or guacamole/avocado, or other toppings as desired). This fajitas look mouth-watering! I’m a big fan of fajitas and carrots so seeing this makes me crave for some! Gonna try out this recipe for sure, thanks! Thanks so much! I can’t wait to hear how you like this recipe! This looks unbelievably good! 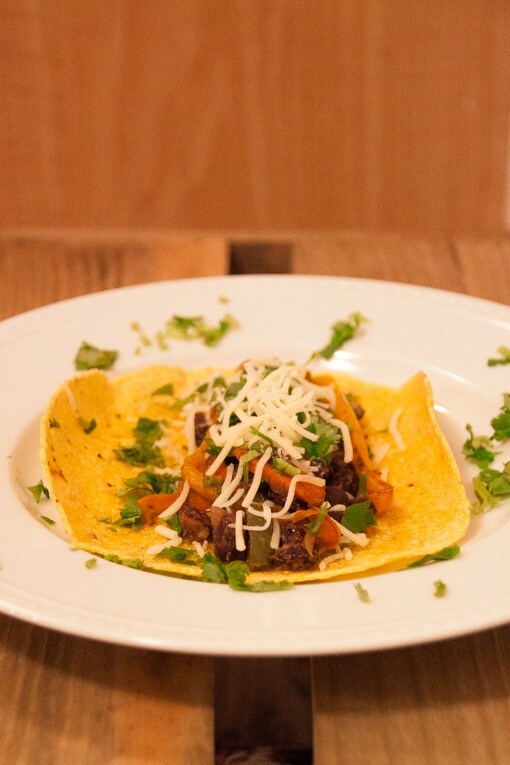 I love fajitas, so I’m always looking for new ideas to make them family friendly and healthy. Thanks for sharing! I’m going to pin this to my pinterest board to save. Yay! I can’t wait for you to try this recipe Suzanne – I’m sure you will love it!